Is Sprinter Sacre a cert for the Champion Chase? The Queen Mother Champion Chase is the highlight of the second day of the Cheltenham Festival, and one of the showpieces of the entire week. This year's race looks intriguing, with defending champion Sprinter Sacre bidding to overcome that uncharacteristic blip on his last start, and clear second choice Sire de Grugy with course questions to answer. Horses of all ages, from five through to eleven, have won this race in recent years. However, the percentage play, in terms of strike rate is to ignore horses with double digit ages. Since 2000, of the ten winners to have an official rating, all were rated at least 160. Tilting at this prize may be wishful thinking then for Module, Astracad, Hinterland and, erm, Wishfull Thinking. Those are the trends then and, aside from a couple of strikes for favourite, Sprinter Sacre, there's little of utility in whittling the field. However, that is quite a significant 'apart from', so let's inspect the case for the reigning champion. 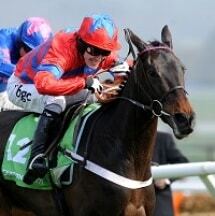 Sprinter Sacre began the 2013/2014 season as the biggest certainty of the Cheltenham Festival. He was in possession of a ten race unbeaten record over fences, and had scored stratospheric Timeform, Racing Post and Official figures. He was just 2/9 to extend that sequence to eleven at the principle expense of his main Champion Chase ante-post rival, Sire de Grugy, in the Grade 2 Desert Orchid Chase at Kempton over Christmas. But it didn't go to plan. Oh boy, did it not go to plan. Sprinter Sacre was pulled up after running little more than a mile and jumping little more than half of the dozen fences. In Sprinter's absence, Sire de Grugy galloped to a workmanlike four length victory over Oiseau de Nuit. It was subsequently discovered that Sprinter Sacre had suffered a heart irregularity, which appears to have righted itself. Now, I don't know about you, but that's not the sort of thing I want to hear when I'm mulling pulling on the punting boots at even money or shorter. The facts with Sprinter Sacre are that he has easily the best form in the race, but in the past eleven months he has completed only about a mile of a single contest. Medical fitness, as well as match fitness, have to be taken on trust. Of course, if he is medically sound and he is pitch perfect for Cheltenham Wednesday, he'll be very hard to beat. And I will be prepared to cheer with the rest if we have our champion back on the big day. But that's sentiment. When it comes to betting, I wouldn't touch Sprinter Sacre with a very long bargepole. I was taken with the way Sire De Grugy won at Sandown, having not been a huge fan of his in the past, and I backed him each way for the Queen Mother Champion Chase, a race which is seriously lop-sided. 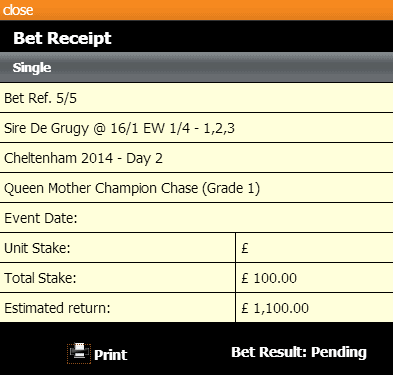 Here’s my rationale: Sire de Grugy is likely to go for the Queen Mum. Sprinter Sacre is too, assuming he can be got fit, and his current issue is resolved. We all hope that will be the case. If it is, Simonsig will surely run in the Ryanair, having won the Neptune over the longer trip a good bit more impressively than he did the Arkle over the shorter trip. Cue Card may tilt at the Gold Cup itself if running close in the King George and, at any rate, would surely go at the Ryanair if not quite getting home around Kempton on Boxing Day. Flemenstar could go for the Queen Mum, but is more likely to race over two-five in the Ryanair. Certainly his racing history suggests that’s the place for him. Kid Cassidy may be aimed at the Grand Annual again, though he’d have a stone-plus more to carry than when second last year. Arvika Ligeonniere got found out in the Arkle last term, and will probably go Ryanair. And that leaves the third of the Henderson horses, Captain Conan. It was far from a disastrous run in third behind Sire De Grugy and, while expected to be fit enough to go close, he’s sure to come on for the run. But he does have ten pounds to find with SdG on official ratings, which are unlikely to change much as a result of the Tingle Creek outcome. So, basically, if Sprinter Sacre runs in the Champion Chase, I contend that a fair number of others will dodge him and go for what could be one of the races of the Festival, the Ryanair. Sire De Grugy will not. He will stand his ground, and 16/1 (quarter the odds the first three) in what could be a small field of few realistic chances, seemed fair enough to me. If Sprinter Sacre doesn’t run for whatever reason, Simonsig and a good few of the others might line up in the Champion Chase instead. In that case, it will likely be a much more competitive race, improving Sire de Grugy’s win chance whilst arguably diminishing his place prospects. Still with me? OK, well that was the rationale. A nice looking voucher, but will he win? If we could back Sire de Grugy now at 16/1, we obviously would. But we can't. He's now a top price of 11/4 and, given his course record, that's no better than a bit tight. Specifically, SdG has run twice at Cheltenham and finished second twice. Both were chases, both were at two miles, and both saw him upsides at the last and then outpaced up the hill. 16/1 each way is still a great bet, not least because I (and others) have 4/1 about the place 1,2,3 - and there may not even be enough runners for three places! But 11/4 about the win is hard to recommend, even without an ante-post voucher. So, the good news is that if we're against both Sprinter Sacre and Sire de Grugy, it's 10/1 bar that pair. The bad news is that picking and choosing between the remaining fifteen engaged at time of writing is not that easy. First of all, I am happy to put a line through any horse with an established level of form and a rating below 160. That means arrivederci to Wishfull Thinking and Astracad. Module is difficult to dismiss completely, as is Hinterland. Both are progressive and both have scope to run to 160+. Module won the Grade 2 Game Spirit Chase last time, beating Dodging Bullets a neck. Dodging Bullets is a fine novice and was giving the winner three pounds, but that's hardly Champion Chase-winning form. The other thing with Module is that he seems to want deep ground. His three chase wins have all been in heavy ground and, though he did bag a handicap at the course on good to soft, it's likely he simply outclassed his rivals that day on his first British start. If the ground is heavy on the day, he is better than a 20/1 shot, his current price. Otherwise, he's not. He also has an entry in the Ryanair. Hinterland is still a novice and, as such, is more likely to go the Arkle route than take on the big boys here. If he did line up, he'd still need another leap forward after a leap forward the last day, when he won the Grade 1 Henry VIII Chase at Sandown. He's ground agnostic at least, so no worries on that score, but he's unlikely to be good enough even if he runs. Benefficient is the third choice in the betting for the Champion Chase, and he's another for whom the Ryanair is a compelling alternative engagement - he won the novice equivalent at last year's Festival. But he's not short of pace, as two Grade 1 wins at Leopardstown demonstrate. Whether he's got the sort of gears needed to prevail in this is another question and, even with the non-runner no bet concession, I'd not be drawn to his chance especially. Captain Conan is a general 12/1 chance, and also has a Ryanair entry. He's rated 161 and has a verdict over Sire de Grugy at Cheltenham to his name, over this trip. That was in the November Novices' Chase of 2012, and both horses have improved markedly since. Captain Conan was found a bit wanting in the Jewson (now JLT) last year, but was a good third to Sire de Grugy at Sandown on his seasonal bow this term. The problem is that he hasn't run since that race, on 7th December, meaning he has an absence of 95 days to overcome. History screams that very few horses win at the Festival in any race after such an absence and it's the scratch treatment for him on the back of that alone. And then comes the enigmatic Arvika Ligeonniere. I love this horse. On his day, he's a proper sort. The Irish handicapper has him at 166 and he's a four-time Grade 1-winning nine-year-old. He has the toe for two but has plenty of form at two and a half too (did you like all those toes and two's?!). So it won't surprise you that he's also entered in the Ryanair Chase, over 2m5f. True, he was awful when pulling up (carrying my money) in the Arkle last year, but he was a 15/2 chance that day and, if that was a blip, then 12/1 non-runner no bet (or 14/1 all in run or not) is a fair win only wager. Al Ferof is still quoted in the Champion Chase, despite his trainer previously saying they were aiming him at the Gold Cup. That was before he looked to fail to stay the three miles of the Denman Chase last time, and he's probably more likely to go for the Ryanair now. He's a very strong traveling horse and, again with the non-runner no bet concession in our corner, he's worth a small interest at 16/1. Winner of the Supreme Novices' Hurdle of 2011, having been second in the Champion Bumper the year before, he disappointed in the 2012 Arkle (fourth) before missing last year's Festival. The balance of his form suggests 2m5f might be optimal but he's got the speed for this, if re-routed. We're still in the realms of the 16/1 pokes, and Kid Cassidy is next on the casting couch for the Champion Chase. So that's KC on the cc for the CC. He's a very in and out horse. When he's good, he's very good, as when trumping Sire de Grugy at Cheltenham in November; or when finishing second in last year's Grand Annual. Whether that's enough to claim this coveted prize is another question and, on balance, I imagine it's probably not. Somersby has been called plenty of names over the years, and has often looked like a horse without a trip. But he has just the one entry - in this - at the Festival, and he's performed with merit going all the way back to the Supreme of 2009 (3rd of 20 behind Go Native that day). He was then second in the 2010 Arkle, 5th in the 2011 Champion Chase, 7th in the 2012 Ryanair, and unseated in the 2013 Champion Chase. Somersby also unseated last time out, behind Sire de Grugy, but between those jockey exits, he won the Grade 2 Haldon Gold Cup and was second in the Grade 1 Tingle Creek. He retains a good bit of speed and class and, if he can iron that recent tendency to decant Dominic Elsworth from his back, he's not a forlorn place hope in a potentially open year. Sizing Europe deserves a mention. Now twelve, he's won an Arkle (2010) and a Champion Chase (2011), and eighteen other races in a stellar career. He's more likely to head to the Ryanair (where have you heard that before?) but a Cheltenham Festival Arkle/Champion Chase record of 1122 is impressive even given his advancing years. After all, he was eleven when finishing second last year. It would be truly amazing if he was win the Champion Chase at his veteran age, but stranger things have happened and 25/1 non-runner no bet is another tempting snippet, perhaps even each way this time.